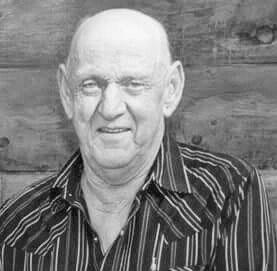 Raymond (Ray) Cameron Neufeld passed away in Dawson Creek, British Columbia, on May 10, 2015, after a lengthy illness. Ray was born in Borden, Saskatchewan, on December 10, 1941, the second son to his parents; Jake and Lydia Neufeld. Ray was always a jokester, loved his family, and had many friends. He enjoyed camping and fishing with his children. Most weekends you would find us heading out to our secret fishing hole. We always had friends or relatives join us. One weekend, a bear came up the bank of the river. The bear went over to a couple of tents beside us and enjoyed the potato salad out of the back of their pickup. Of course Ray was pounding two pots, trying to scare the bear off. The pots never recovered. The bear ran down the riverbank and Ray jumped out of the camper, in his underwear, to gather rocks. When the bear returned, Ray threw rocks at it, one hitting the bear in the middle of the head. The bear shook his head and decided to leave. The funny part is the people in the tents never heard a thing! Ray attended school in Onoway, Alberta, and was a trucker at heart. In 1970, he met the love of his life, Patricia, in Edmonton, Alberta. On August 14, 1971, they were united in marriage and from this union came four beautiful children; Cory, Rana, Terri, and Lonni. Ray being a trucker, was in Bakersfield, California, when Cory was born. Dawson Creek, developing many close friendships over the years. Ray was predeceased by his parents, Jake and Lydia, his older brother Eugene, and his younger brother Gerry. Marilyn McMillian, and numerous nieces and nephews. At Ray’s request there will be no funeral service. In lieu of flowers, please donate to the South Peace Hospice/Palliative Care Society.